The debt-to-GDP ratio compares a country's sovereign debt to its total economic output for the year. Its output is measured by gross domestic product. In the fourth quarter of 2018, the U.S. debt-to-GDP ratio was 105 percent. That's the $21.974 trillion U.S. debt as of December 31, 2018, divided by the $20.865 trillion nominal GDP. This ratio is a useful tool for investors, leaders, and economists. It allows them to gauge a country's ability to pay off its debt. A high ratio means a country isn't producing enough to pay off its debt. A low ratio means there is plenty of economic output to make the payments. If a country were a household, GDP is like its income. Banks will give you a bigger loan if you make more money. In the same way, investors will be happy to take on a country's debt if it produces more. Once investors begin to worry about repayment, they will demand more interest rate return for the higher risk of default. That increases the country's cost of debt. It can quickly become a debt crisis. What's the tipping point? A study by the World Bank found that if the debt-to-GDP ratio exceeds 77 percent for an extended period of time, it slows economic growth. Every percentage point of debt above this level costs the country 1.7 percent in economic growth. It's even worse for emerging markets. There, each additional percentage point of debt above 64 percent will slow growth by 2 percent each year. The debt-to-GDP ratio allows investors in government bonds to compare debt levels between countries. For example, Germany's 2017 debt is $2.7 trillion, dwarfing that of Greece, which is $514 billion. But Germany's GDP is $3.8 trillion, much more than Greece's $281 billion. That's why Germany, the largest country in the EU, had to bail out Greece, and not the other way around. The debt-to-GDP ratio for Germany is a comfortable 72 percent, while that for Greece is 182 percent. So, is the debt-to-GDP ratio a good predictor of which country will default? Not always. Japan's debt-to-GDP ratio is 228 percent. Japan is not in danger of default, because most of its debt is held by its own citizens. A lot of Greece's debt was held by foreign governments and banks. As Greece's bank notes became due, its debt was downgraded by ratings agencies like Standard & Poor's, which made interest rates rise. Greece had to find a way to raise more revenue. It agreed to cut spending and raise taxes to do so. This further slowed its economy, further reducing revenue and its ability to pay down its debt. The U.S. debt-to-GDP ratio is 104 percent. Why are investors concerned that it will default? Unlike Greece, the United States can simply print more dollars to pay off the debt. For this reason, the risk of default is very low. On the other hand, the debt holders wind up with money that's worth less. This will eventually make them avoid U.S. debt. As a country's debt-to-GDP ratio rises, it often signals that a recession is underway. That's because a country's GDP decreases in a recession. It causes taxes, and federal revenue, to decline at exactly the same time the government spends more to stimulate its economy. If the stimulus spending is successful, the recession will lift. Taxes and federal revenues will rise, and the debt-to-GDP ratio should level off. The best determinant of investors' faith in a government's solvency is the yield on its debt. When yields are low, that means there is a lot of demand for its debt. It doesn't have to pay as high a return. The United States has been fortunate in that regard. During the Great Recession, investors fled to U.S. debt. It is considered ultra-safe. As the global economy continues to improve, investors will be comfortable with higher risk because they want higher returns. Yields on U.S. debt will rise as demand falls. When yields are high, look out. That means investors don't want the debt. The country must pay more interest to get them to buy its bonds. That creates a downward spiral. High-interest rates make it more expensive for the country to borrow. This increases fiscal spending, which creates a larger budget deficit, which creates more debt. A good example is the Greece debt crisis. That's why the debt-to-GDP ratio, for all its faults, is still widely used. It's a good rule of thumb that indicates how strong a country's economy is, and how likely it is to use good faith to pay off its debt. To figure the debt-to-GDP ratio, you've got to know two things: the country's debt level and the country's economic output. This seems pretty straightforward until you find out that debt is measured in two ways. Most analysts look at total debt. Some, like the CIA World Factbook, only looks at public debt. That's a little misleading. In the United States, all debt is essentially owned by the public. Here's why. The U.S. Department of the Treasury has two categories. 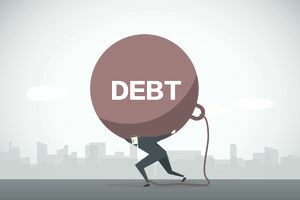 Debt held by the public consists of U.S. Treasury notes or U.S. savings bonds owned by individual investors, companies, and foreign governments. Public debt is also owned by pension funds, mutual funds, and local governments. The other category is Intragovernmental Holdings. This is the category not reported by the CIA World Factbook because it's debt the federal government owes to itself, not to outside lenders. The CIA figures if the government doesn't repay itself, so what? It's just a method of accounting between two agencies. But it does matter a lot. The money the federal government "owes itself" is really owed mostly to the Social Security Trust Fund and federal department retirement funds. Thanks to the baby boomer generation, these agencies take in more revenue from payroll taxes than they have to pay out in benefits right now. That means they have excess cash, which they use to buy Treasurys. The government just spends this excess cash on all government programs. When the boomers retire, Social Security will cash in its Treasury holdings to pay benefits. But the cash to pay this debt will have to come from somewhere. There are fewer working-age people than boomers. As a result, the dependency ratio is worsening. The Treasury will have to issue more debt or Congress must raise taxes. Therefore, you should always look at the total debt, not just the debt owed to the public. That's because all federal debt is eventually owed to the public. That's why Intra-governmental Holdings should be counted in the ​U.S. ​debt-to-GDP ratio. What Is the Public Debt? Is the U.S. Budget Deficit Really That Bad? Will the United States Ever Default on Its Debt?